I wore this outfit while on holiday and I meant to blog about it last week but alas I ran out of computer time! it's not an outfit I'd reach for on a daily basis but when I'm feeling a bit more edgy I love to wear my leather skirt. I actually bought it last winter but it's one of those pieces that has lasted through to the following season and I'll probably wear it until early next year so it was definitely worth the purchase. 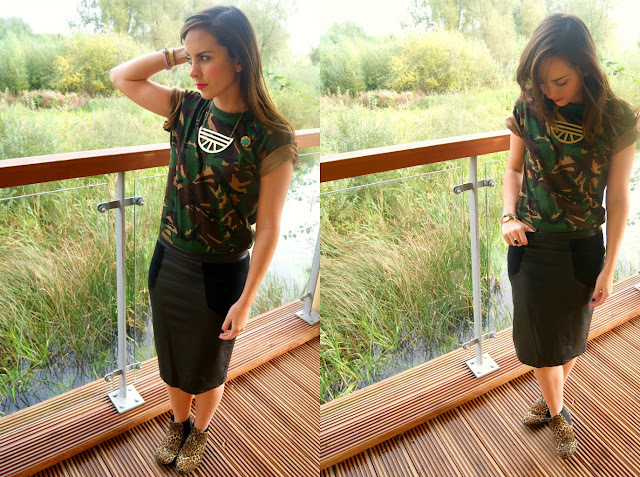 I'm still loving the camo trend but I'm growing a little weary as it's so popular now! luckily I live near an independent army surplus shop and I can pick up tee's for a fraction of the high street price. I'd recommend you check for any near you before you invest in the topshop or urban outfitters versions! I'm also wearing my new urban outfitters necklace and regal rose ring that I picked up in the look show goodie bag, I love accessories so I'll be checking out their site for other gothic inspired items. I am loving the Military look at the moment and your outfit is amazing, i want it all! i think its better with pants.